Some of the striking street art featured on the Real Berlin Experience Tour. It’s my first time in Berlin. Sure I’m ticking off the iconic sights like Check Point Charlie and the Brandenburg Gate. But in this world capital of street art and alternative culture, I’ve also gotta get down and dirty. 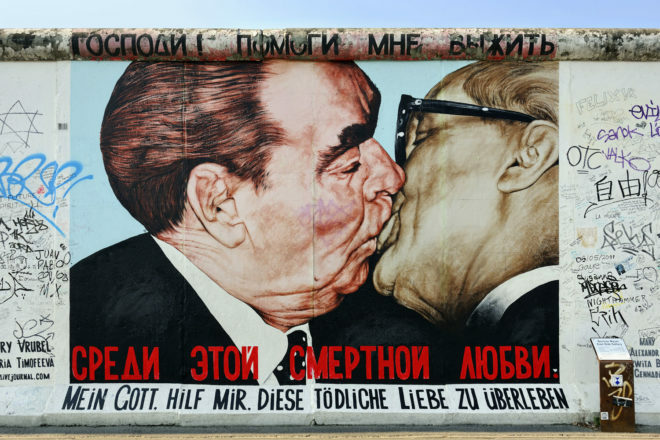 A few taps into Google directs me to the Real Berlin Experience which promises to ‘explore the cultural landscape from the local perspective seeing some of the world’s best street art’. I decide to give it a shot and plan to meet our guide at the Berlin TV Tower, outside Starbucks. I’m not hopeful, given the starting point. Turns out our guide Ben Spalding, a young American from Maine, is a German-speaking part-Puerto Rican street artist. “I do large animals and explore anxiety.” In fact, all the guides are practising street artists. In the space of a block, Ben points out and explains tagging (a form of city ownership or gangs marking their territory), stencils, screen printing, taping, ceramics and knitting. And he puts it into context as we walk through the layers of history in this most paradoxical of cities. Berliners have been scarred by a long history of state intrusion into their private lives, from the Nazis through to the Stasi. As a collective backlash, it is pretty much open slather on the street today. You can drink alcohol, carry up to 15 grams of marijuana, smoke anywhere, cavort with a prostitute. You can even barbecue naked in the famous Tiergarten, if you so want. And you can create art. Though if you are caught in the act, the penalty is much lower for paperwork, which is why screen-printed street art is big here. Walking through Berlin’s now gentrifying old Jewish neighbourhood, we pass a Banksy rat. “Fake,” says Ben. Proof of street art’s increasing commercialisation. We stop at Otto Weidt’s brush and broom workshop, where he protected his blind Jewish workers during the Holocaust – now a poignant museum. Some incredible street art is cloistered in this area also, including an aerosol pointillist-style portrait by Aussie artist Jimmy C.
A quick subway ride brings us to the East Side Gallery: the public face of Berlin’s street-art scene along a restored section of the Berlin Wall. It’s touristy but worth a visit – it’s the longest open air gallery in the world at 1.3 kilometres. Ben is ready to turn up the heat, though, in nearby Kreutzberg, home to Turkish and Vietnamese immigrants. We are dumbstruck by the scale, technique and searing social commentary of what we discover here. On one corner of Oranienstraße, we see huge black and white scrawny animals dangling along the side of a five-story building, painted by Belgian artist ROA, who trained as a vet. Across the intersection is a gripping work of photo realism by French artist MTO. Jack Nicholson, in all his manic leering madness from The Shining, peering through the wall with a larger-than-life-size orang-utan. At the former Berlin Wall, Italian artist Blu has filled the side of a building with two white figures, each trying to grab the mask off the other as they make the sign for East and West. We finish at street art hub Urban Spree – a not for profit organisation that holds exhibitions, performances and workshops. Under a post-modern decaying archway, Ben explains how Portuguese artist Vhils used chemicals and explosives to carve a sculptural portrait using the building’s very bricks and mortar. Stunning. And, a commission for Levi’s. The famous jean company wanted to extend their reach into the street art scene so used Vhils’ artwork in their ‘Go Forth’ campaign. In fact, ironically a number of street artists are now getting paid commercially for their work. And so the interchangeable world of anti-art and art as commodity takes a tumultuous turn. But thanks to Ben’s passion and knowledge of this controversial art I understand the streetscape now and can join the conversation. Susan paid $16 for the four-hour tour.